Men have argued about who could beat up whom since cave paintings first depicted the local tough man taking on a wooly mammoth. Most of these arguments are never resolved. But, in the case of the Rocky fighters, we finally have definitive rankings determined by a prestigious panel of former champs, top writers and the sharpest handicappers from the world of boxing. Our panel: Former heavyweight champs: Riddick Bowe andJames Bonecrusher Smith.Boxing media luminaries:Adam Abramowitz,Scott Christ,Patrick Connor,Matt Digiallonardo,Steve Kim,Michael Rosenthal,Mario Serrano, andJimmy Tobin. Boxing handicappers:Tom Craze,Joey Oddessa,Evan Young and me. You’ll find more about the panel at the end. Let’s get to it. Mason Dixon finishes sixth with 20 points in spite of holding the IBF, WBA, WBC and The Ring Magazine belts. Bonecrusher and Bowe both ranked Dixon last, with Riddick declaring him overrated. The titles didnt sell Connor because the fact that Dixon was driven to the brink by an old and weathered Balboa says quite a bit. That Dixon required a bout against an old and weathered Balboa to restore credibility means he had little in the first place. Tobin said, Just like the character he played in real life, Antonio Tarver, Dixon was kind of boring, and really, only happened because the more beloved and decorated champion couldn’t stay away from the game. Oddessa added that Dixon had no drawing power. Christ puts a more positive spin on it, saying, Dixon didn’t have the size or muscle tone of his roided-out series forefathers, but in a weak era, he was a dominant champion. Kim also criticized Dixon for the Balboa fight but noted that he had good skills, as a tall and lanky southpaw. “The Clone Ranger” and “Rocky’s Robot,” as he is called in Rocky V, gets no respect from some voters. Craze notes his fine amateur pedigree, but Christ says, he shouldnt even count. Oddessa calls him the worst of the bunch, who wouldn’t be fighting a cold on a modern PPV if he wasn’t a white kid. Riddick Bowe says, “he didn’t do much for me,” although both he and Bonecrusher rank Gunn above Dixon. While I ranked him fifth, I would be in no hurry to bet against a guy with Tommys finishing ability.On the other hand, youre always going to worry about the fact that hes 100% headcase, as Abramowitz points out. Maybe Union Kane was a paper champ, but Gunns total annihilation off an undefeated titlist should not be dismissed. Tobin admired Gunns hair. “The Southside Slugger” from Rocky III picked up 56 points, only one point fewer than the third place finisher, and got two first place votes. Lang had the most decisive win over Rocky in the series, which got him a second place vote from Abramowitz. Oddessa had him number one because he was all street, all animal. Tyson before Tyson, and points out his accomplishments came without proper training or the benefits that come with a good promotional team. Another handicapper, Evan Young, ranks him second. Christ says that Lang mixed crushing power with a menacing aura, and killed Mickey with words. Bowe called him a tough, black badass who reminds me of a real fighter. Craze counters that his “limitations were exposed in the Balboa rematch. Chief among these was stamina, according to Kim. He had great intensity and strong as a bull, but anger was his strength and downfall. Connor points out that the Clubber could be out-smarted. For example, Balboa wasn’t the greatest boxer around, but he managed to befuddle Lang for stretches in the rematch. 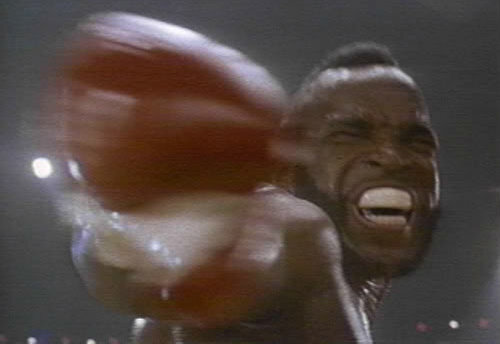 Tobin also has Clubber at number one and rebuts such claims: Sure, Clubber lost the rematch, but he has a stoppage victory over a guy who could endure more abuse than a pair of steel toe boots. 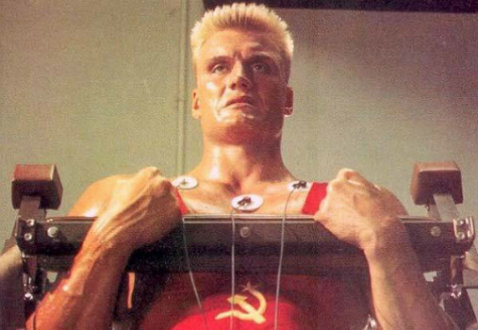 Ivan Drago, also known as The Siberian Bull and Death From Above, might be the hardest guy on the list to rank, but he got 57 points and one first place vote, from Mario Serrano. Well never know Drago’s potential, according to Oddessa. His physical tools might be superior: Size, power, steroids… As they said, he was a machine, says Connor, though he also identifies a “weakness to the body.” Drago went straight from the amateurs to the top level where he was a fearsome operator, but probably could have benefited a longer developmental period. Craze was impressed by his TKO by death of Creed. Digiallonardo liked what he saw from Drago enough to rank him second. On the other hand, Connor said the Creed win was not as good as it seemed on paper. Abramowitz, doesnt feel he made the grade at the pro level: Let’s face it, he couldn’t go 12 rounds with an old Rocky. Bowe thought that the source of Dragos downfall was overconfidence. Kim acknowledges Dragos superhuman power but objects, c’mon, he was juiced to the gills. He’d have a hard time passing most drug tests. So weve also got the Barry Bonds problem in ranking him among the greats. Christ calls him a juiced phony. 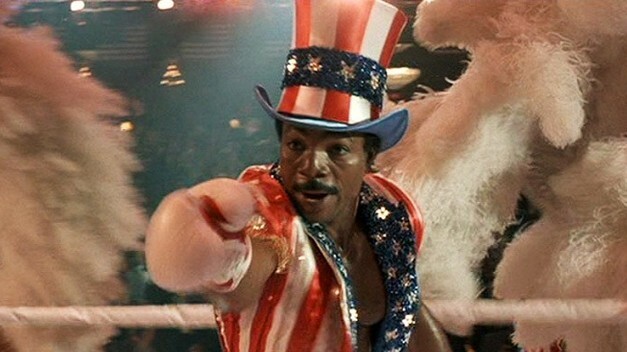 Apollo Creed, The Master of Disaster, The Dancing Destroyer, The King of Sting, The Count of Monte Fisto, The Prince of Punch and The One and Only garnered three first place votes (including mine) and 62 points in the poll. I think his speed and skill would present a challenge for anyone he faced. Connor agreed, saying His combination of hand speed, footwork and ring savvy would likely translate to the greatest chances of beating the others on the list. Creed backed up these attributes with good power, a good chin plenty of heart. Kim also had him first, owing to a wicked jab (perhaps this is why Oddessa compared him to Larry Holmes) and dazzling skill and said, beneath all that flash was a certain toughness. Both Bonecrusher and Big Daddy had him ranked second and Bowe echoed Kim, saying Creed was flashy but confident. Tobin ranked him fourth, deeming him a bit of a clown, but granted that the way he demanded to get off his stool against Drago was the stuff of legend (and movies). His matches with Rocky were both razor thin and Conner points out that in a more realistic world, both fights might have been stopped in favor of Creed due to the facial damage Rocky accrued. And I agree with Christ that Creed’s arrogance got the best of him in the first fight, making it closer than it might have needed to be. Creed had the tools to beat Rocky cleanly but Rocky imposed his will and forced a fight on his terms, as he so often did. Those same tools, if used properly, should allow Creed to pose a problem for any fighter. We don’t know much about his record prior to the Balboa fight, but to hear him tell it, Creed was looking for a novelty match up with The Italian Stallion because he had cleansed the division of serious challengers. No surprise here, as Balboa takes it with 77 points and eight first place votes. Who else? asks Rosenthal. Digiallonardo and Young rank Balboa number one as do both of our former world champs. Bowe says he has no talent, but overcame that with heart and determination. All heart and overachiever, echoes Odessa. Abramowitz notes that Balboa beat the best with a flair for drama, and indeed, he defeated every other man on the list by knockout, save what Craze deems a meaningless loss to Dixon that really came post-retirement. I think the fact that Balboa was able to change styles and tactics so late in his career (with the help of Creed) is a sign of greatness. Kim highlighted Balboas vicious body punching, but ranked him second because of his mediocre record… let’s be honest, even Mickey admitted he protected him during his title reign. 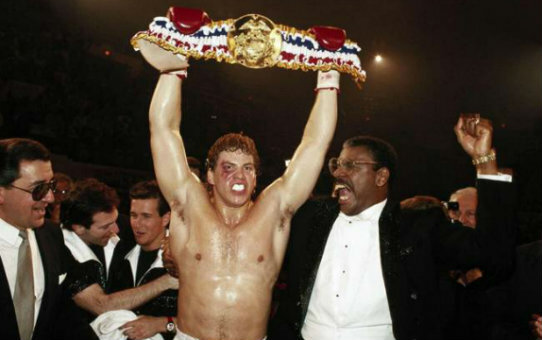 Tobin ranked Balboa third but made special note of his accomplishments outside the ring: He got a ton out of his talent, had a robot maid, stayed with a woman who was at best a 6 and was beloved in a city that doesn’t like anything. Oh, and he ended socialism. Socialism dude.